Scotty’s Furnace & Duct Cleaning is a professional, family owned and operated company and is the area’s leader for indoor air quality. We offer air duct cleaning, dryer vent cleaning, furnace & boiler cleaning services in Richland, Ashland, Crawford, Knox, Morrow and surrounding counties. With many years of experience, you can trust Scotty’s to provide professional services to improve your air quality and ensure your safety. The indoor air quality in your home is important. 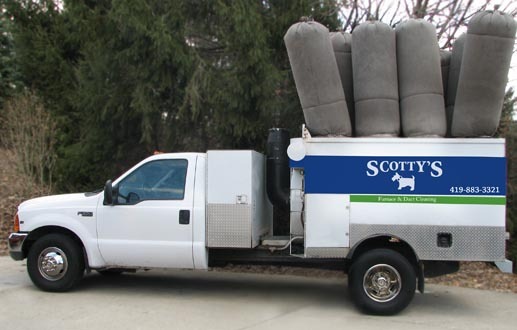 Scotty’s can be sure that the air you are breathing is clean. 1. Locate the air return and vent covers within your home. Remove the covers with a screwdriver. 2. Wash the vent covers completely and allow them to air dry. 3. Remove the air filters if they are installed. If they are reusable filters, wash them with a strong stream of water, and then allow them to air dry while you clean the ductwork. 4. Fit your vacuum hose with a soft brush attachment, and tape it in place with duct tape. Vacuum into the air ducts as far as you can reach. 5. Using a spray cleaner and old rags, clean around the mouth of the vent and ducts. Wash the inside of the ducts clean around the walls of the vent and ductwork. 6. Replace the air filters, and then reattach the clean vent covers.